Fear of death is a common concern for children aged 4-8. Children at this age lack an adult concept of time and they do not yet have the experience and knowledge to see the world in a rational way. Death can therefore seem like a very scary concept and many adults tend to avoid discussing the subject through fear of upsetting their child, which can unfortunately make the fear worse. If you discuss the topic head on and early on, your child is less likely to be afraid. Discussing death in biological terms and introducing the lifecycle (birth-growth-getting older-dying) can really help a child to understand how life works. Also focusing on the here and now and highlighting all the positives that are happening for them in the present is a helpful way to manage death worries. Praise them for asking questions about it and try to be open, being aware of any anxieties you may have yourself about dying and death. Fortunately most children outgrow death worries as their thinking matures, however if the fear continues for more than 6 months your child may be suffering from thanatophobia (death phobia) and further psychological help, such as CBT may be needed. 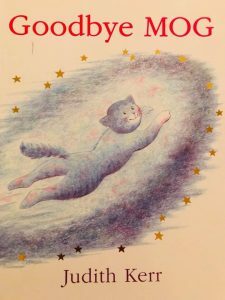 If you have not yet touched on the topic of death with your child this beautifully illustrated book ‘Goodbye Mog’ by Judith Kerr introduces the concept gently. I like how the lifecycle starts again when the family buy a new kitten.